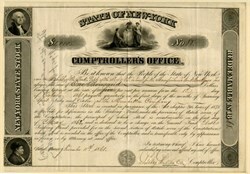 Beautifully engraved certificate from the State of New York Comptroller's Office issued in 1861 and was due in 1868. This historic document has an ornate border around it with a vignette of George Washington, a man, and two allegorical women sitting beside a shield with an eagle perched on top of it. This item is hand signed by the comptroller and is over 154 years old.